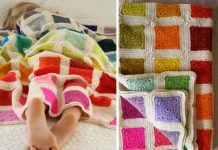 Wow…What a amazing Blanket it is ! So many beautiful and colorful flowers on one blanket! Just like the pattern name–Happy Little Tree, this blanket can really make you smile and happy everyday. 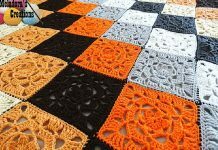 This free pattern used a fun and quirky granny square and Join as-you-go method. Happy Little Tree Blanket Crochet Free Pattern can be a great home decor or gift to your family and friends. 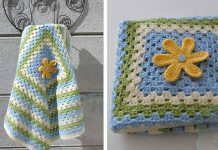 You will enjoy the whole crochet process and love the final output! Thanks Cypresstextiles for sharing this free crochet pattern on cypresstextiles.net. The link for the free pattern is provided below photo. Happy crocheting.